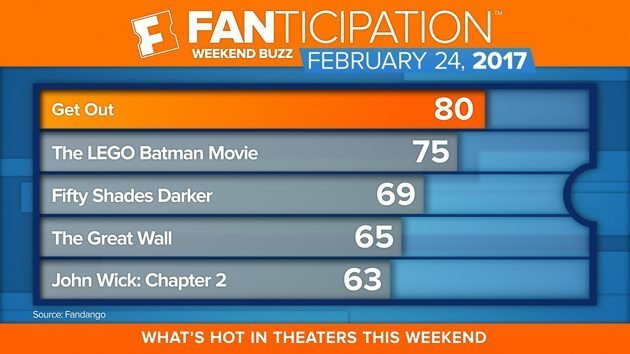 Los Angeles (February 23, 2017) – Jordan Peele’s new thriller “Get Out” is leading Fandango’s weekend sales and topping Fandango’s Fanticipation movie buzz indicator with 80 out of 100 points. “Get Out” is outselling previous Blumhouse thrillers “The Gift” and “The Visit” at the same point in the Fandango sales cycle. 92% are excited to see a thriller with provocative social commentary. 74% are looking forward to the conversations the movie will spark with friends at the theater. 53% plan to make it a social event and will get together with friends before or after the film. Exclusively for Fandango, director Jordan Peele offered up his impressions of celebrities reacting to his film, “Get Out.” You can watch his impersonations of Beyoncé, Oprah, Keanu Reeves, Barack Obama and other celebs in this shareable video at https://www.youtube.com/watch?v=ZbOEvqtKQCY.